Robert Kaplan, President and CEO of the Federal Reserve Bank of Dallas, will share his experiences and expertise as keynote speaker at the Forum on Entrepreneurship Breakfast Series on Dec. 1. Kaplan became the 13th president and CEO of the Federal Reserve Bank of Dallas on Sept. 8, 2015. He represents the Eleventh Federal Reserve District on the Federal Open Market Committee in the formulation of U.S. monetary policy, and he oversees the 1,200 employees of the Dallas Fed. He also held various positions during a 23-year career at the Goldman Sachs Group, Inc., and spent nine years on the faculty of Harvard Business School. On Sept. 27, the Forum Breakfast series featured Adam Hamilton, P.E., president and CEO of Southwest Research Institute. Past speakers include Daymond John, “Shark Tank” investor and founder of FUBU; Colleen Barrett, president emerita and corporate secretary of Southwest Airlines; Stuart Parker, CEO of USAA; Paula Gold-Williams, CEO of CPS Energy; and Bill Greehey, chairman of NuStar Energy, L.P. The series’ 2016-17 title sponsor is PwC. For information on sponsorship opportunities and purchasing tables and individual tickets, please contact Pamela Duffy, CAP-OM, at forumbreakfast@stmarytx.edu or 210-436-3124. 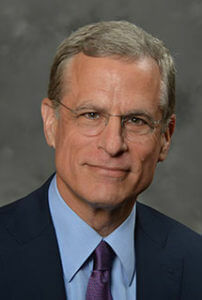 Before taking the reins of the Dallas Fed, Robert Kaplan was the Martin Marshall Professor of Management Practice and a Senior Associate Dean at Harvard Business School. Before his time at Harvard began in 2006. He was vice chairman of Goldman Sachs, with global responsibility for its Investment Banking and Investment Management Divisions. Previously, he served as global co-head of the Investment Banking Division. He was also a member of the firm’s Management Committee and served as co-chairman of the firm’s Partnership Committee and chairman of the Goldman Sachs Pine Street Leadership Program. Kaplan served in several other roles at Goldman Sachs, including head of the Corporate Finance Department, head of Asia-Pacific Investment Banking, and head of the high-yield department in Investment Banking. He became a partner in 1990 and was given the honorary title of senior director when he left in 2006. Currently, he serves as co-chairman of Project ALS and co-chairman of the Draper Richards Kaplan Foundation, a global venture philanthropy firm that invests in developing nonprofit enterprises dedicated to addressing social issues. He is also a board member of Harvard Medical School. Kaplan previously served on the boards of State Street Corporation, Harvard Management Company, Bed Bath & Beyond, and Heidrick & Struggles International, Inc. He was also a trustee of the Ford Foundation; founding board chair of the TEAK Fellowship; co-founder and chairman of Indaba Capital Management, LP; and chairman of the Investment Advisory Committee at Google, Inc. He also was appointed by the governor of Kansas as a member of the Kansas Health Policy Authority Board. Kaplan received a B.B.A. from the University of Kansas and an M.B.A. from Harvard Business School.